The SHSU ROTC battalion celebrated its being selected as best in the 12th Brigade on Thursday afternoon. The group, which consists of about 90 cadets and nine cadre members, was awarded based on the overall academic standing, outstanding summer camp performance and the 13 students commissioned last year. They may be a part of “An Army of One” but the Sam Houston State University ROTC has stood out so much this past year that the group was recently named the top battalion for the 12th Brigade. Beating out ROTC programs such as Texas A&M and the University of Texas at Austin, as well as about 17 others, the SHSU battalion was also selected as the best medium-sized school for the 12th Brigade by the Cadet Command, which oversees about 272 universities across the country that are placed into 14 Brigades. “ Within the Western region there are brigades, and my brigade is located in San Antonio,” said Lt. Col. Alan Mooneyham, head of the SHSU military science department. “It encompasses all of the schools in New Mexico, Texas and Oklahoma that have ROTC programs. From those schools in the brigade, we were selected as the top overall school. “ Basically, we are one of the top 14 ROTC programs in the nation,” he said. The top ROTC program is selected based on three criteria: academic standing, summer camp performance and the numbers of students commissioned as military officers annually. The battalion “excelled” in their performance at the 32-day summer camp held annually at Ft. Lewis, Wash., Mooneyham said. The number of cadets commissioned by the military science department last year also “worked to our favor,” Mooneyham said. Mooneyham said he is proud of the battalion because it is a culmination of four years of hard work since he has joined the staff. He also acknowledges that it was a group effort that got the battalion to this point. “ I am extremely proud; we have a great team here,” he said. 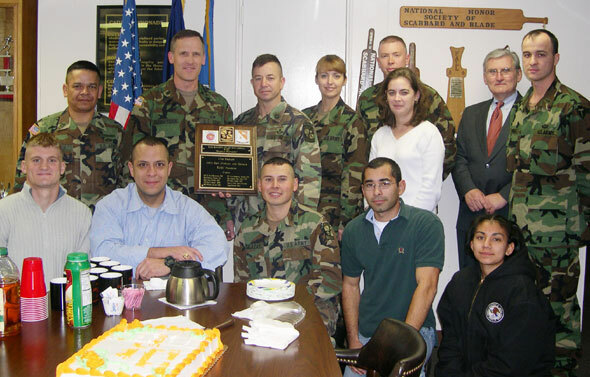 “Every one of the cadre members, the staff here, have all made a huge contribution that went towards us being recognized. “ The Sergeant Major for example, he’s in charge of our physical fitness program, and we had the highest in the brigade and exceeded national averages; the commissioning and contracting of our students, Maj. (Rosanna) Dolphin, she does a lot of that,” he said. Along with the recognition of being named top battalion, the department received $2500.